It is pretty surreal thinking of how far the God Eater franchise has come in the West after a PSP release that was followed by nothing for a long time. Everyone I know who wanted some hunting action on PlayStation platforms ended up importing the Japanese releases or playing Toukiden. 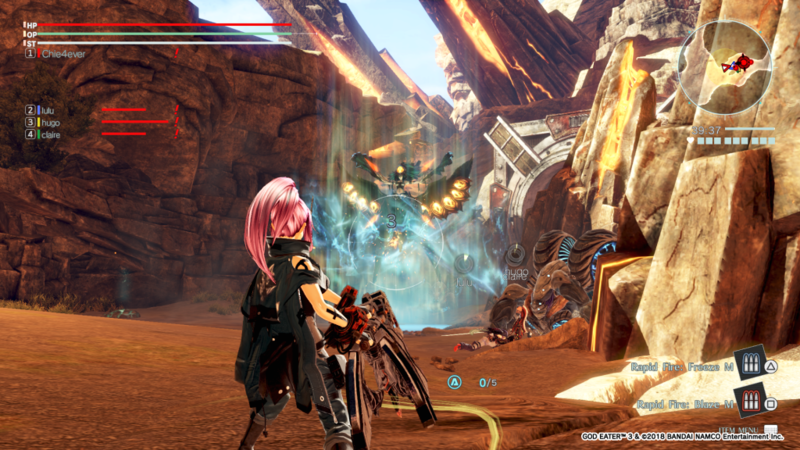 Thankfully, Bandai Namco localised both Rage Burst and Resurrection for PS4, PS Vita, and PC in a single package. While that release clearly showed its PSP roots even though it looked a lot better, God Eater 3 is here as a true current generation God Eater game and it manages to do so much right. Unlike earlier entries, this one has actually been developed by Marvelous Entertainment and before you start raising your pitchforks, they have done a great job. God Eater 3 is releasing on both PS4 (and PS4 Pro) and PC at the same time. Even though both platforms have access to earlier games and God Eater 3 is a mainline numbered entry, this is very approachable for newcomers. The tutorial missions do a great job of teaching you the various mechanics that are introduced at a steady pace. While it does feel a bit daunting initially with so many new terms and mechanics if you’ve never played a game in the series before, you can always go back to older missions and experiment or practice. I spent a good amount of time replaying old missions while trying new weapons and skills. When it comes to the story, God Eater 3 doesn’t do anything mind blowing but I’ve always loved how it blends a completely over the top and edgy flavour into a genre that usually never sees anything like this. You start out in a prison cell as a custom created character. Speaking of custom characters, the game has already been patched pre-release to add even more customisations. As you begin hunting Aragami (the monsters in the God Eater universe), the overarching plot is slowly revealed. Hilda takes you on board her travelling Ash Crawler that serves as a transportation vehicle. This sees you trying to help her fulfil her contracts initially before the real story begins involving something that was thought to just be cargo initially. God Eater stories are always fun to experience if you like anime. If you’ve never played a God Eater game before, you can totally jump in with this one. The God Eater games are action hack and slash games that blend in a healthy dose (does such a thing exist) of anime with a hunting loot loop. God Eater games have fast-paced combat and God Eater 3 turns this up to 11 with new mechanics that play brilliantly in tandem with the old ones. 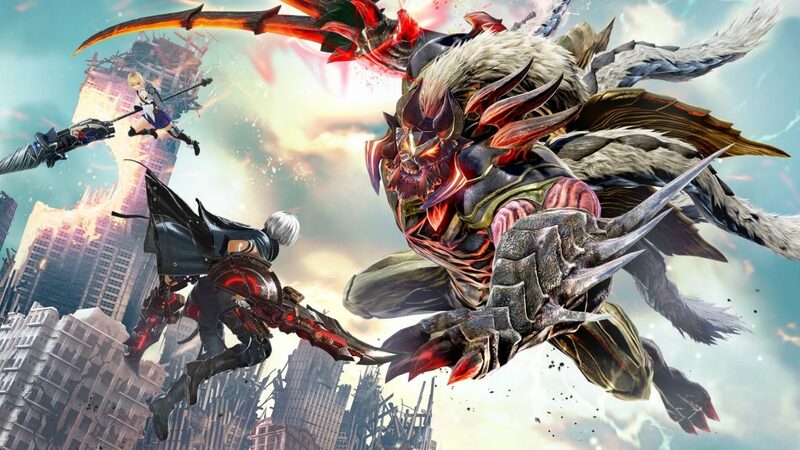 God Eater 3 has new weapons as well and I spent most of my time with with the Biting Edge: dual blades that can transform. People who can wield the God Arc are called God Eaters. This God Arc is the only thing that can defeat the Aragami. The great thing about God Eater’s combat loop is you’re constantly on your toes trying to attack, keep your burst gauge level high, and pay attention to the new mechanics. Acceleration Triggers are new to the series with God Eater 3 and there are various options you can use for them. The default one gives you a buff if you manage hitting 5 combo finishers. Paying attention to this alongside the Burst gauge constantly has you in the action. Engage is another new mechanic that rewards you for fighting near another God Eater which sees characteristics shared. What I love about these additions is how an already fast-paced and involved combat system now has everything more intense. Devour and quick devour where your God Arc transforms to literally devour has never looked or felt this good. The new dash that uses up a good amount of your stamina to let you propel yourself towards an Aragami if you’re locked on or just propel yourself in the front is a game changer not only for movement but also for combat. Structurally, you will be following a simple loop of adjusting your loadout before heading into a mission to hunt Aragami of various kinds. Each mission rewards you with materials and blueprints that you can use to craft or upgrade weapons and items that you will use to get stronger for your next mission. Each mission location while varied visually isn’t really as interactive and alive as I had hoped for in a current generation entry. The Aragami (especially the special Ash ones) have interesting attack and movement patterns which keep things fresh. There are of course the usual low tier ones that serve as appetizers in the beginning moments of missions. The story is still split up into missions of varying difficulty that are grouped and there are various side missions that show up if you feel like taking a break from the main story ones. I had only watched a few Japanese trailers initially and while things looked nice, I obviously didn’t get a feel for it until I tried the first demo for it that released on PSN in Japan. It felt like a huge step up from the earlier PS4 entries but needed work. Thankfully, the developers improved a lot for core movement at least and the final release feels great almost all the way. The hub movement is awfully slow still and you basically need to keep the run button pressed but in mission movement with the air dash is awesome. Visually, God Eater 3 looks gorgeous with the cel-shaded look and is a lot more colourful than past entries. While environments look better, they still are pretty basic in terms of structure. 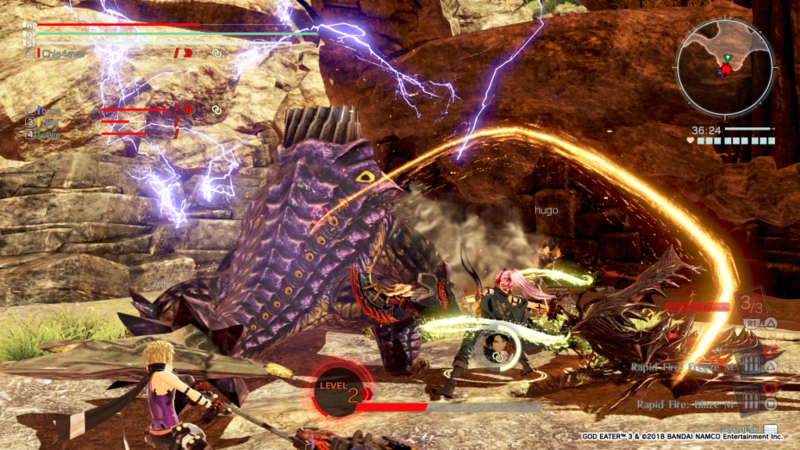 The real standouts visually are the animations and effects during combat. I love the particle effects and screen splatter effects here. 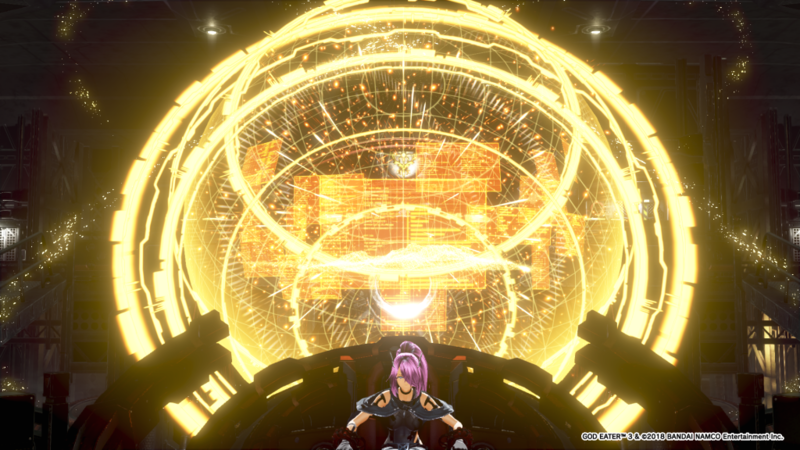 Unlike the localisations of God Eater 2: Rage Burst and Resurrection that only featured English voice acting, God Eater 3 has full dual audio support. Bandai Namco Entertainment was obviously unsure how the series would do earlier in the West and the success has given them enough confidence to invest more into the localisation. You can select voice language from the main menu only, however. The English voice acting is very good and for a game that is as fast-paced as this, I can’t imagine having to read subtitles during combat for anything. Go Shiina returning for the soundtrack here is the highlight though. The soundtrack is full of great orchestral tunes and some cheesy rock that perfectly suits the story missions. God Eater 3 has some things holding it back though. Environments while obviously much prettier than earlier entries aren’t really creative in terms of structure. They just feel like corridors leading to hallways and don’t expect to interact much with the environments here aside from just zipping all over the place trying to find items or materials following the indicators. The other big issue is with the camera. In some situations especially ones where you’re in a small place, the camera can get annoying and you will find yourself fighting with that more than the Aragami. It isn’t a problem all the time, but happens enough to be annoying overall. The text size and readability during cutscenes and in game text for dialogue could’ve been a bit better as well. God Eater 3 is almost everything I wanted in a current generation God Eater experience. I love how it isn’t afraid of going all out with the edge and anime, but still manages to be an absolute blast to play. If you’ve been curious about this franchise but wondered if it was the right time to jump in, God Eater 3 is exactly what you need. It is good to see Bandai Namco not only localising this one soon after the Japanese release, but also doing right by fans with dual audio options and global matchmaking. This isn’t pushing the franchise as far ahead as Monster Hunter: World did for Monster Hunter, but it is a damn fine way to rid itself of the PSP roots for a proper current generation title. I’m really interested to see how Code Vein turns out because loads of fans including myself were skeptical how God Eater 3 would turn out since the main team were handling another game. Thankfully at least God Eater has turned out excellent and I can’t wait to revisit it for online and the post-launch DLC the developers have promised.